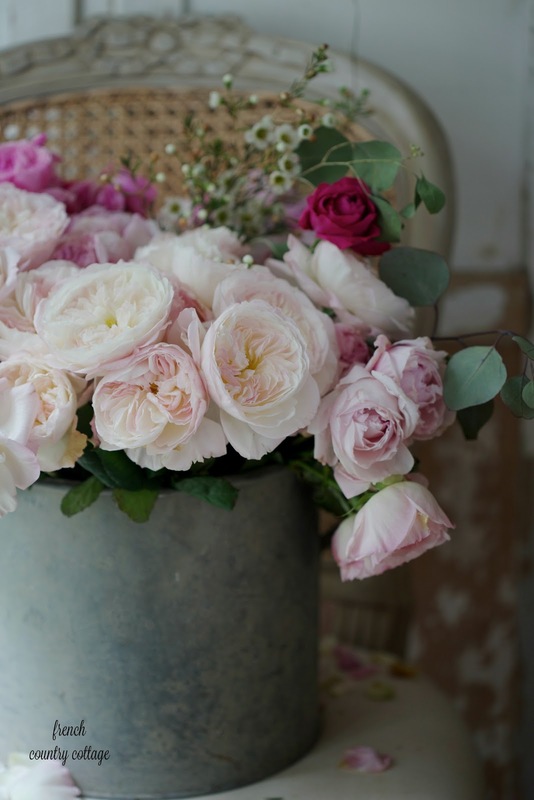 A bucket of blooms- A simple way to add beauty to your home - Sometimes simple is exactly perfect. 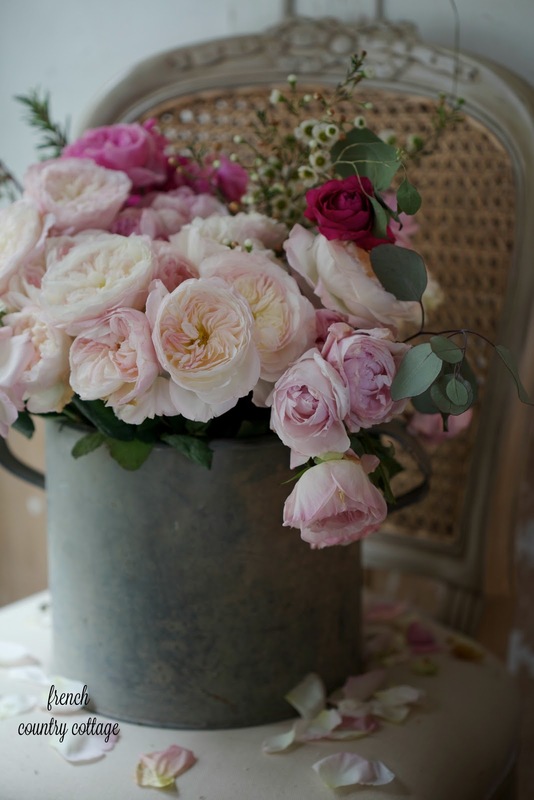 And an old zinc bucket filled with garden blooms... is absolute perfection. Sometimes simple is exactly perfect. and you spot something that talks to you in one of those loud voices that you just can't ignore. I see you looking at me with that twinkle in your eyes. And you argue with yourself. Even if it is a zinc bucket with the perfect amount of old patina and charm. I mean, there was no way that chunky bucket was going to fit under the seat on the plane. Or in the overhead bin. But I picked it up and wandered around with it. And then found a second bucket that was even bigger. and I threw my hands up in the air. I carted both of those vintage buckets out of the market. and a large open weave wicker French laundry basket. I figured I might as well ship it all. Yes, it is called insanity. And I rationalized the amazing deal I got on each item to my husband as he helped me lug them to a shipper... and he told me I was insane. But I told him I was nowhere near insane. These were awesome and they wouldn't cost much to ship one state over to California. made me a little queasy. Well, that was until those chunky zinc buckets arrived. sprigs of eucalyptus and wax flowers. since they had just arrived for a project. They were a perfect simple beautiful arrangement. So I left them there and started to play a bit. 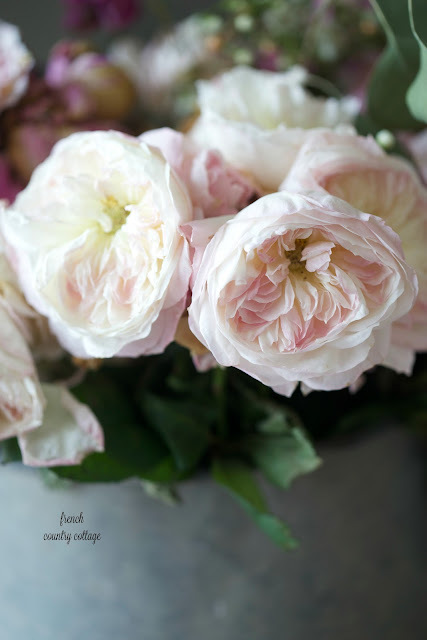 I'm pretty sure that soft romantic blooms in a zinc bucket are always a good idea. And avocado on seed bread with a sprinkle of feta. 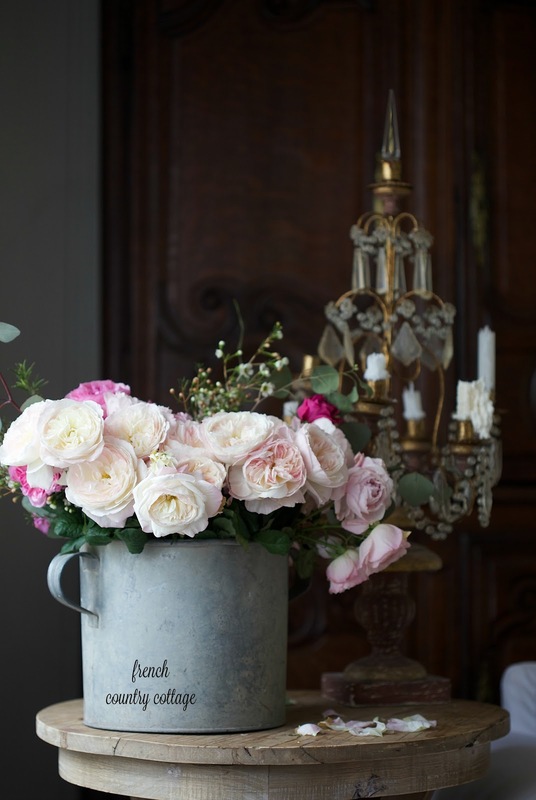 And that old bucket full of roses on a French inspired cane back chair? it makes my heart do a little flip flop. vintage charm and romantic blooms loving heart. and you won't want to miss any of their beautiful flower filled posts today. My photos want to be yours when they grow up. I literally have no words for your amazingness. So beautiful! Good decision bringing those buckets home:) Also, I wanted to thank you for your reply to my question yesterday! I'll let them know you referred me. You are very much sane...have all your faculties about you...the zinc bucket is amazing. Seeing those gorgeous flowers in the rustic zinc bucket has to make anyone smile. 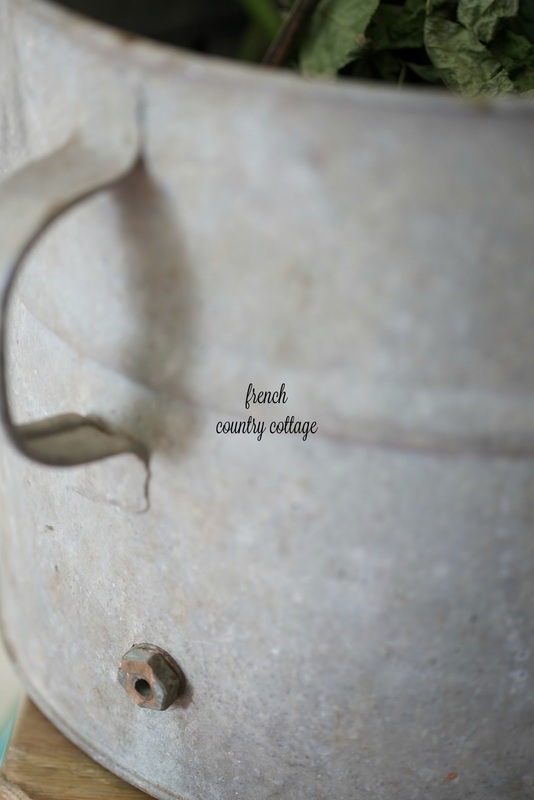 I have an old mud stained well bucket that is zinc. I need to fill it with flowers. Thanks for the inspiration! As always, just beautiful!! 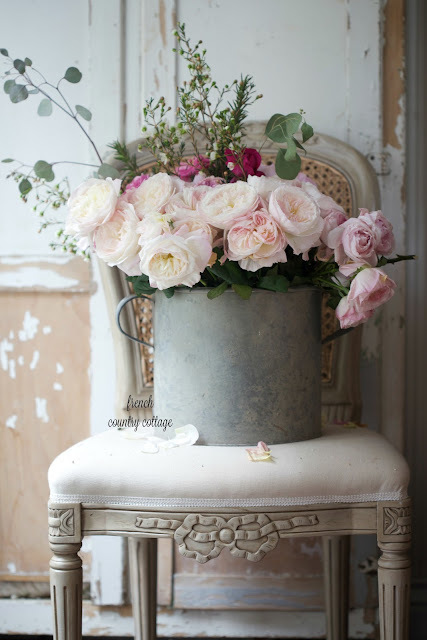 I so love your buckets, and the bucket and flowers just speaks to my and my heart. So crushing these photos. 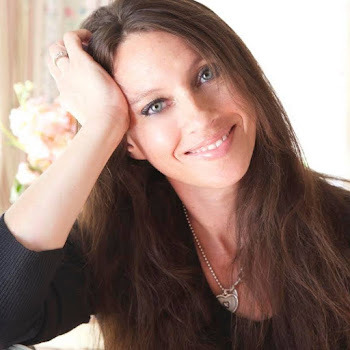 The last photo in this post is THE most artful and beautiful! 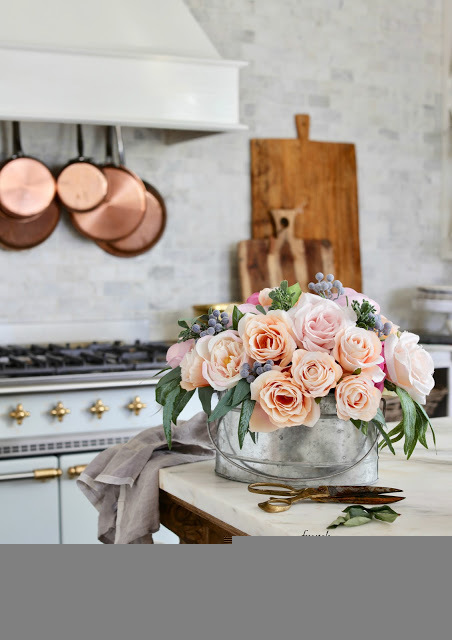 All the components are perfectly placed in relationship to each other and the chair complements the zinc bucket and the extravagant blooms perfectly! Can you tell I'm a photographer? And that I LOVE eye candy? To me this last image is sheer perfection. I wish I could hang it up and look at it every day! 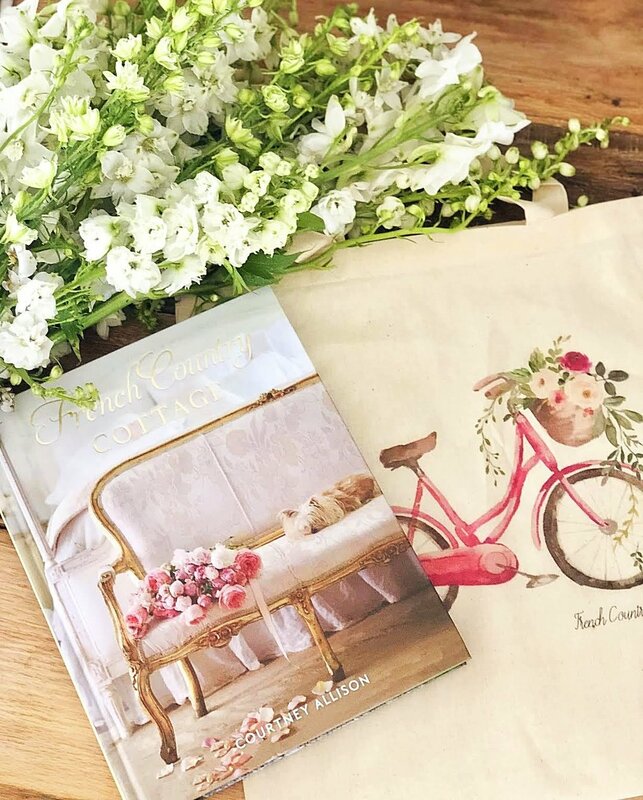 Thanks for sharing your shopping expedition! Always so beautiful. 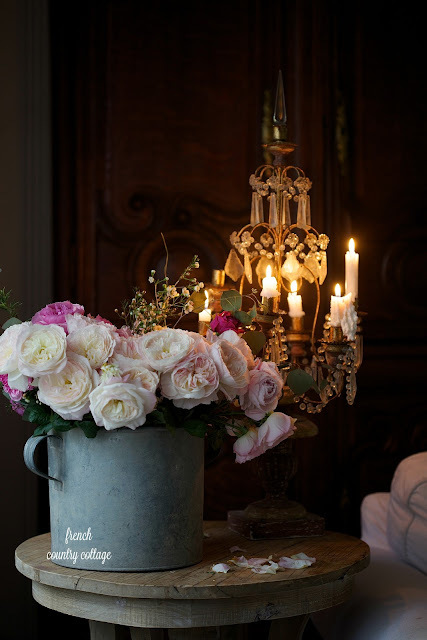 Your photography is on point, especially the picture with the chandelier! Plus, I adore that bucket! Thanks for sharing with us all. Have a blessed weekend, my friend. I went to Ireland 4 years ago and fell in love with a basket that would hold six bottles of wine. It had a small red checked cloth liner. My friend said "it's too bad that you can't buy that, there is no way you could fly back with it". She was a fairly new friend and didn't know me quite that well. Just don't tell me that I can't have something just because it can't fly home with me. I went back to the shop bought the basket, went to the post office and paid quite a bit more to ship it back home along with some other goodies. Just like you, if I was going to ship it I figured I may as well make the most of the opportunity. Needless to say, I spent more than the cost of the basket, but I love that basket and it makes me smile every time I look at it. I decorate it for Christmas with goodies, ribbons tags and anything else that makes my heart sing. Enjoyed the post, thanks for the sweet memory you conjured up today. 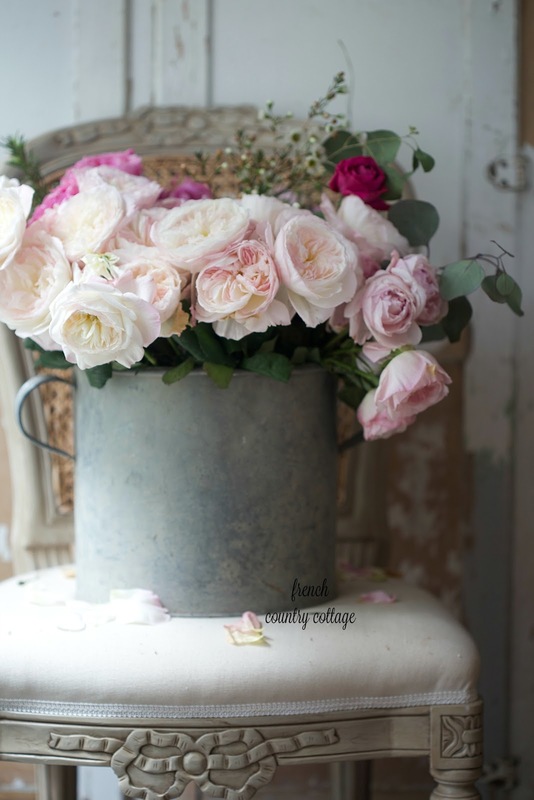 NO one does zinc buckets and lacy sweet blooms better than you do. 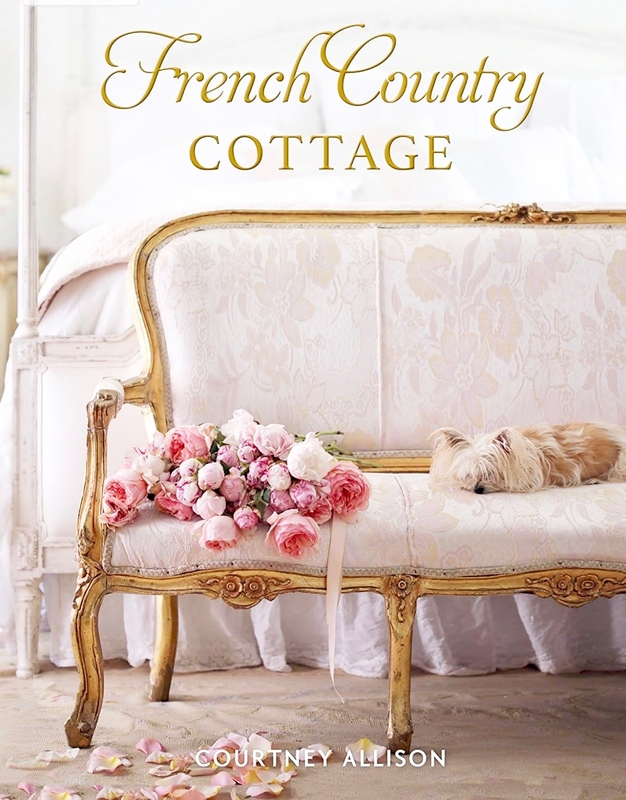 You have been and shall always remain the Reigning Queen of that romantic French look. Love the shipping story. Your hubs is funny. Insane? Maybe. Great finds, Courtney! 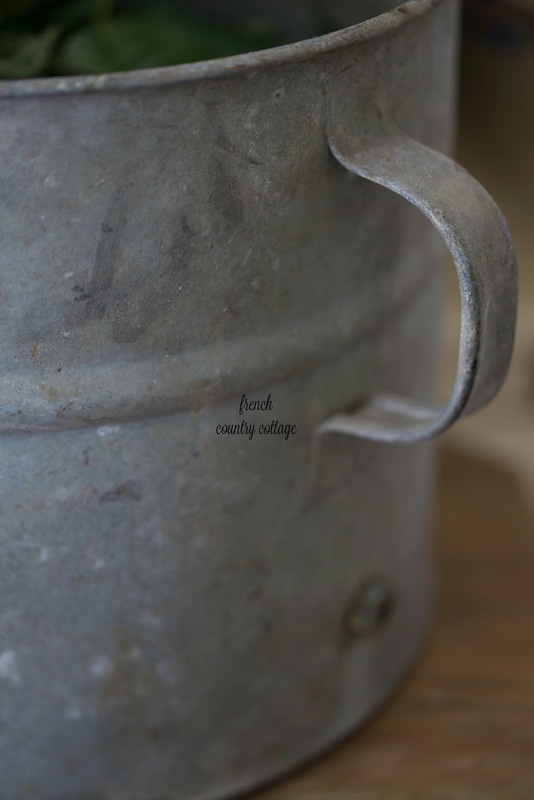 I do love zinc buckets ~ I have a tiny one I bought years ago at an antique store. It has been all around our houses then lived out in the shop holding nails and lost screws for a time. Happily pinned several of your photos, as always. 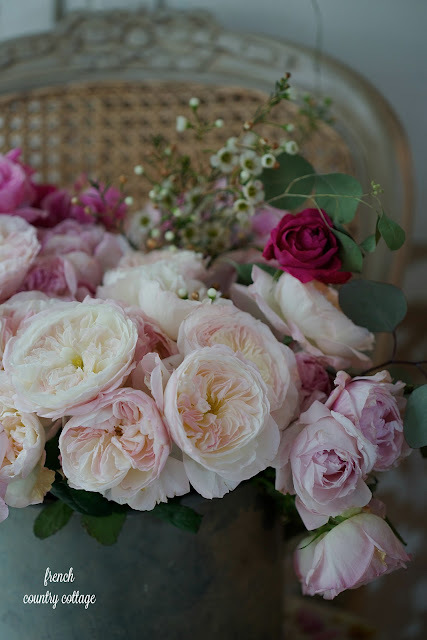 Your bouquet is just beautiful!!! 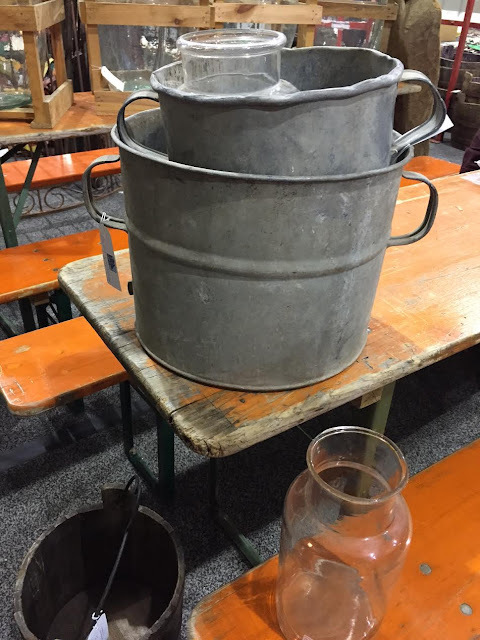 Do you know what these buckets were used for? I recently purchased one just like yours. It even has an embossed stamp but I have no idea what it’s purpose was with those two side handles.